As our frequent readers may recall, not so long ago we covered opening up of the basic resident registry system to foreign residents. 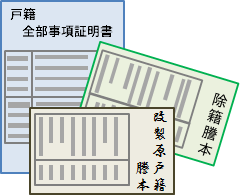 Until very recently, the so-called "residence register" (jumin-hyo 住民票) used by localities to provide public services and collect tax revenue has only been available to Japanese residents. However, even though foreigners are now able to get on their own address registry, they still can't get a "family registry" (koseki 戸籍). Let's take a look what a koseki actually is. The venerable koseki has its roots in ancient China where it was first used as a sort of family census. As a matter of fact, other Sino-centric countries such as Vietnam and Taiwan still use a similar system and South Korea only recently abolished its traditional koseki style system in favor of a Western style individual identification number. Japan is also in the process of making an individual ID number system but it will be supplementing, not replacing the koseki. The koseki has been around in one form or another since the days of the Shogun, but it was officially codified into law in the early Meiji Era. The earliest koseki were written out by hand using daiji (大字) style traditional Chinese numerals to prevent fraud and stamped with the seal of a local offical. Nowadays, almost all koseki have adopted a new electronic format (see below) for easy record keeping and amending. Up until the late 1970s, pretty much anyone could waltz into a city office and browse the koseki record books. 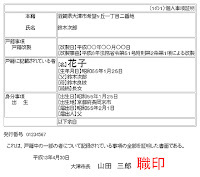 This was actually used a fairly potent discrimination tool by schools, employers, and local officials as it was easy to look up the linage of burakumin (部落民) or families that traditionally held "unclean" jobs like butchering or corpse handling. By the 1980s, new law had been enacted to ensure that koseki records were only available to family members and/or local authorities under very specific circumstances. What is a Koseki and Why Can't You Have One? Simply put, the koseki is a register of family members, births, deaths, adoptions, and so on. It is essentially a birth, death, and marriage certificate combined into one form. More importantly, it is legally defined as sole proof of Japanese citizenship. Therefore, unlike the basic resident registry which just contains information about your abode and immediate family, foreigners are not permitted to have a koseki, even in the case of marriage to a Japanese national. The koseki is a necessary document for family altering events (death, divorce, and marriage are too big ones) or for signing up for something like a passport. The only legitimate way for a foriegner to get a koseki is to become a naturalized citizen. This includes taking a name in kanji Characters and renouncing your current citizenship. So unless you are really, really serious about it, getting your own koseki generally isn't worth the hassel. Interesting enough, the only Japanese people without a koseki are members of the Imperial Family. The entire family linage is instead recorded in the Imperial Family Record (kotofu 皇統譜). In Japan, until you are married you are quite literally just a foot note in your father's koseki. Legally speaking, a koseki can only contain one last name and one head of household (setai nushi 世帯主). Since Japan is a country steeped in patriarchal tradition, the head of household is almost always the father. The person who's name is at the top of the koseki is known as the hitto-sha (筆頭者) and all family members are recorded under his or her name. When a couple get married, they must file a konin todoke (婚姻届) form to create a new koseki. Marriage is not legally binding until the nyuseki (入籍, literally "entering into the family registry") is preformed at a municipal office. Usually the bride applies to enter the family registry of her soon-to-be husband, thereby forefitting her family name. 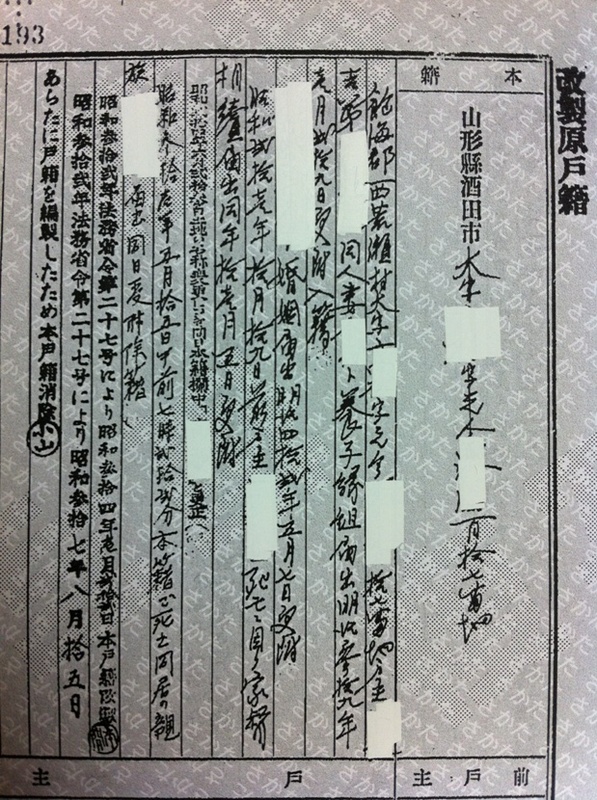 The husband will then be granted his own shin-koseki (新戸籍) or "new family registry." However, while linage tends to be culturally patriarchal, there are no legal restrictions on a husband taking a bride's name. While taking your wife's name is rare, it is sometimes done when marrying into a family that has a particularly well known name (i.e. very wealthy and powerful). The only exception to this rule is when one marries a non-Japanese spouse. Amendments to the koseki are generally limited to births, deaths and marriages, although it is possible to grant or release parental authority to minors via amendments to the koseki. However this only happens under extraordinary legal circumstances. Naturally, births will result in an extra entry into the koseki and deaths will result in a deletion from the koseki (joseki 除籍). Mutual and court mitigated divorce will also result in a koseki deletion and the non-head of household must either rejoin her family's koseki or create a new koseki. There are two main types of koseki that are available to the public: koseki tohon (戸籍謄本) and koseki shohon (戸籍抄本). The koseki tohon is essentially the full koseki with all family members, dates of deaths and births, etc. The koseki shohon is just the information for one individual family member. However, there is another type of special koseki known as a 戸籍除籍謄本 (koseki joseki tohon) that includes any deleted entries including deaths and divorces. These special koseki are only used for changing names on titles after death as well as inheritance and tax settlements. Many localities also allow you to request an old style koseki (kosei gen-toseki tohon 改製原戸籍謄本) from the local archives. These include two main types of old fashioned koseki: ones made under Show Era (1926-1989) rules and ones made under Heisei Era (1989-present). 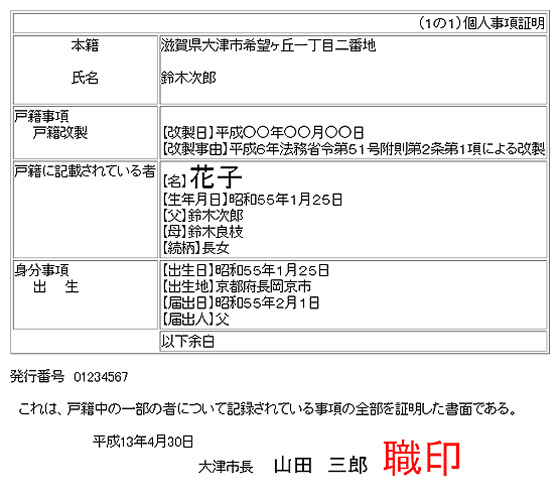 Unlike the residence registry, a koseki need not be updated when you move. As a matter of fact, when you go to make a new koseki in the case of a marriage, your local city hall will ask you where you want it posted to. You can keep it in your current area of residence or simply ask for it to be sent to another locality of your choosing. What is the advantage of having your honseki separate from your residence register? Usually it is just be due to a family member moving out and taking a new permanent residence. However, some people like to keep their family registry in their town of birth even if most of the family has packed up and moved out. In the event that you need a koseki copy and you cannot come get it in person, municipalities will post it to you for an additional fee. Until recently, the honseki was recorded on your drivers license and other personal documents but due to privacy laws less and less official documents contain a person's honseki. However, many legal forms still ask for it as a formality. If you come across this as a foreigner, simply put your country of citizenship. Do you know any other interesting legal facts about koseki or related topics? Feel free to let us know in the comment section! Useful article! I was looking for current information after the 2012 reforms and I found it. Foreign residents now can have a juuminhyou but still can't have a koseki because the koseki only comes with Japanese citizenship. Got it! I am a Japanese citizen and I am marrying a Filipino man is it okay if we will use my surname instead of using my fiancè's surname?thank you for your response this is really helpful. Yeah I want to know that also, if is it fine to use the Japanese(woman)'s name instead of your spouse name. We're getting married soon but we have a child and I named my baby after my surname(Japanese). Hoping for a response. I am a Filipino and married to a Japanese i want to have a copy of our kuseki tohon,i want to know if our marriage is really register in japan...how can i get a copy on my own...pls help...tnx! I want to know if how to delete the family member in koseki tohon, I found out that my husband's son is not his biological child. I am a filipio and divorced to a japanese. .i have a child but i dont like to regirter him to his father surname. Is it possible to have my child own koseki?